The camera and photography have been my primary means of creative expression for the past 35 years. During this period I photographed extensively all over the world in conjunction with the travels required by my careers. I retired in 2000 which gave me the time necessary to explore other forms of art such as drawing and painting. Today I use various mediums including oil, watercolor, gouache and ink. My paintings and drawings involve primarily man-made subjects however also animals, people and landscapes. I have received various awards and display my work in numerous local venues. This is my studio, which is located just north of Corvallis, where visitors are always welcome. Email me for an appointment. Understatement … of … the ... century. Bergen’s humble characterization of his foray into the art world is at odds with the colorful and creative explosion of work that he produced since deciding to pursue photography, drawing and painting after retiring from a large tech firm in 2000. After abandoning art class for college prep as a teen, Bergen went on to earn a degree in electrical engineering from Cal-Berkeley (‘67), joined the U.S. Air Force via officer training school and later maintained overlapping careers in the service and with Hewlett-Packard while adding a second degree..
After 23 years in the Air Force, he retired as a Lieutenant Colonel. While at HP, Bergen’s leadership roles varied from product manager (marketing), production manager (manufacturing), quality manager, operations manager to transition manager. He also had a stint as president of the HP Colorado Federal Credit Union and served as an HP liaison to Congress. In all, Bergen reckons he traveled more than one million miles in business trips working as a supervisor on various projects for Bill and Dave’s famous company. He’s proud of his years of service and work, but has one major regret. What is he passionate about now? The piece has a fanciful backstory concocted by the artist. The scene of the painting is lightheartedly set in Corvallis’ Central Park circa 1890 with the newly completed Benton County Courthouse in the background. Take a look at the painting again … do you now see the famous styles and characters that Bergen has slipped in as an ode to several famous artists? Some of Bergen’s most recognizable work includes slightly warped, wonky -- but always delightful -- renditions of local landmarks and places. Bergen manages to keep them familiar while finding a more whimsical than straight-forward approach to memorializing them in lines and color. “I’m very fast. I don’t do photo-realistic, small brush dibble-dabble stuff,” he said. Every day, every outing might result in a new piece. 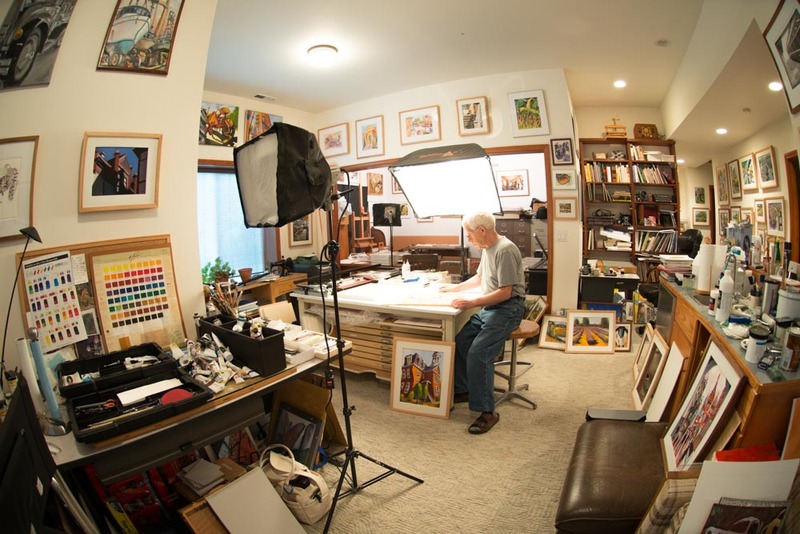 The walls of Bergen’s home studio in North Corvallis are covered floor to ceiling with his work. In addition, he’s a regular on the Vistas and Vineyards en plein air painting excursions with other local artists. “I paint every day. I usually get up at about 5:30 a.m.. I paint for about an hour and half in the morning,” he said. “Then, I spend the rest of the day framing and mounting. I do giclee printing,” he added. Bergen has funneled his passion not just into practicing and developing his own artistic skills, but also into supporting and bolstering the local arts scene through various leadership positions. He is currently on the executive board of directors for the Corvallis Fall Festival, on the board for the Corvallis Art Guild (also a past president), past chairman of the annual Clothesline Art sale on the Benton County Courthouse lawn, and a past president of the local Photo Art Guild. He maintains a printing business through his home studio for at least a dozen other local artists. This year’s Fall Festival will include a Camera Obscura area with the Photo Art Guild and an artist demonstration booth featuring a number of local artists, including Bergen who will demonstrate his technique painting with oils.